My inbox is deluged with rants and demands from people who are insisting that This. Rally. Must. End. NOW! My day job is working in an asset management firm. From that perch, I look at the world as a series of risks and opportunities. I am not a political analyst, nor a professional Fed critic. If through my research and analysis I come to a conclusion about a given issue — Bailouts, Fin Reform, Foreclosures, Stimulus — I am happy to share them. But make sure you understand this much: I consider many other factors beyond the macro. This includes sentiment data, liquidity, market breadth, trend, volume, and valuation. And while liquidity can mean many things, this cycle its been pretty much all Fed all the time. That was what hedge fund manager David Tepper was referring to when he noted the Fed was pouring fuel on the fire. When the Fed sends their minions out to discuss the Bernanke Put, they add even more gasoline to the conflagration. Some people rush for the fire hoses, but my job requires me to grab some marshmallows and sticks and head over to the boy scout jamboree campfire. As to the present rally, it will end (eventually). I cannot tell you if it ends with a 25% correction (thats my high probability bet) or a 55% 2008-09 like crash, or a Prectorian 90% end of civilization collapse. Regardless of how the rally concludes, the folks who missed an 85% generational run up in equities will pound their chests and say “See, we told you so!” And they will have made absolutely no money in the process. 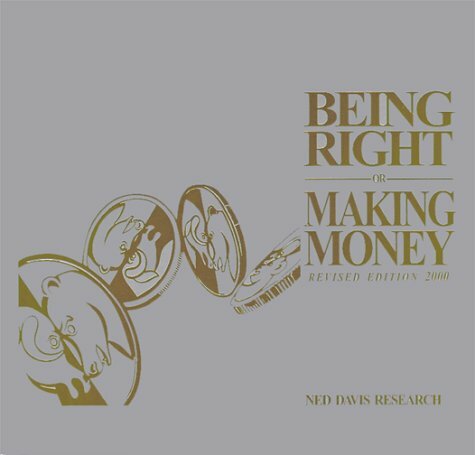 So for all of you Kremlin Fed watchers, politicos, policy experts and amateur economic wonks, I put Ned Davis’ question to you now: Would you rather be right, or make money?